A luxury bathroom design should include the best bathroom features available. This bathroom is larger than most with a design goal to create a spa-like sanctuary where pampering happens every day. A soaker tub is the epitome of luxury for any bathroom. Select the right material for your tub, such as a cast-iron, copper or brass for retaining the bath water heat longer than a porcelain or acrylic tub. Acrylic and fiberglass tubs are the least expensive, but crack and fade over time and use. Stone and wood tubs require regular maintenance to keep looking good as do copper and brass tubs. Kohler allows you to customize with length, width, height, type of hydrotherapy, heated surface, music, shape, water depth, and type of material for free-standing soaker tubs. Prices range from $2,667 to $9,565. A luxury bathroom must-have is the tub room. This can be defined by a stunning bay window or simply be an offset extension to the main bathroom. Announce this grand addition with a pair of columns on either side of the door opening. You can add draperies tied back when not in use. Tyrrell & Laing International, Inc. offers high-end soaker tubs, including a tub for two and natural stone tubs. Prices range from $2,400 to $12, 650+. It's not enough to simply have a sculptured soaking tub. If you live in a tropical climate, you can create an outdoor tub room complete with high walls and lots of lush plants for an exotic setting for outdoor bathing. Add a pergola with wisteria, climbing roses, or ivy. For colder or seasonal climate, an outdoor tub room effect can be created with a glass ceiling to take advantage of star gazing and windows to open during warmer months while being surrounded by a year-round garden. Nothing says luxury better than radiant heat floors. Stepping onto marble floors that are warm against bare or wet feet brings home the pleasure of a truly opulent bathroom design. 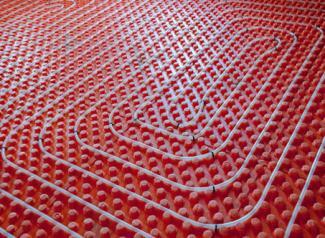 SunTouch and ThermoSoft make electric radiant heat systems designed specifically for bathroom stone and tile floors. SunTouch mats can be ordered to fit your floors. All the installer needs do is unroll the mat and install. The price for SunTouch mats is about $304 for a 10 square foot system, while ThermoSoft is regularly priced about $136 for 7.5 square feet. 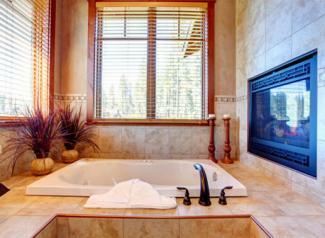 In planning your bathroom layout, be sure to allow enough square footage to accommodate a gorgeous fireplace. After all, you need a place to set a chaise lounge chair to take a small nap or simply enjoy the after effects of relaxation from a soaking bath, steam shower, massage, or sauna. The fireplace surround can make or break the look you're going for. Home Depot can save you money, while offering a super luxurious look with a Louis XIII cast stone mantel that's part of its Historic Mantels Designer Series. It costs about $1,490. Another fireplace option that is a popular choice is a wall-mounted fireplace at the end of a drop-in tub design. This added feature can provide a romantic flair as well as warmth to bath time. Select from an electric wall fireplace from Wayfair for about $640 or a gas remote controlled wall fireplace from eFireplaceStore for about $1,393 and install it at one end of your tub wall. A true luxury bath design features a separate shower that is styled with exquisite finishing touches, such as fixtures and tile choices. You can go with a glass shower ($852), an oversized shower ($4,560), a steam shower ($4,499.95) or a even a custom designed walk-thru two-person shower. 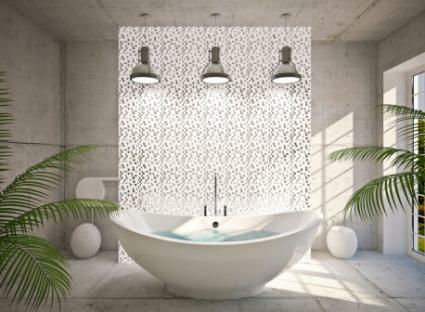 A custom designed walk-thru shower can be made with two sets of shower heads, body jets and sprays. A space-saving design is to place the shower at one end of the bathroom with a soaker tub placed in the center of the outside wall. This creates a symmetrical design with the entrances into the walk-thru shower on either side of the tub. Price will vary depending on style, tile, and fixtures. A truly luxurious bathroom will include either a steam shower or sauna. Available square footage and features are often the deciding factors for which one is right for you. There are many different steam showers on the market. A luxury steam shower is fully loaded to include massage jets, chromatherapy, ceiling and handheld showerheads and a built-in radio. Atlas International Inc offers one that features 20 acupressure body jets designed for massage therapy, a steam sauna, two stools, and a computer control panel. It's priced around $4,490. A high-end sauna is sold by JNH Lifestyles. 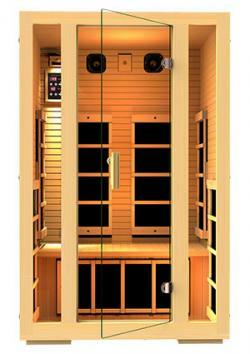 This two-person Infrared Sauna features seven carbon fiber heaters. FSC Certified "Green" Wood ensures that the construction doesn't contain any chemicals or plywood with no chemicals added. If you prefer a customizable sauna, then Finnleo® 's Designer Saunas, assembled from pre-fabricated panels, offer some great choices. Price will vary depending on features selected. Having a massage therapist come to your home is the ultimate pampering. Make it easy on your therapist and yourself by including a massage area in your bathroom design along with your own massage table. This is the way to personalize your therapy and create that serene ambiance only this kind of luxury can convey. Massage King offers several choices of home massage tables. Leave it up all the time for added convenience. Prices range from $119 to $647. Forget hiring a masseuse. The Hydro Massage table is the ultimate home therapy choice. Used in chiropractor offices, you can bring it home. The table system uses water through air technology and jet system for a full body massage. Pressure ranges are customizable with 17,000 user massage options. Choose from seven models. The price is around $19,900. A warm towel to great you after a steam shower or long soak in a deep soaker tub is a must for any luxury bathroom. Radiant towel racks come in all designs and sizes. The finishes can include brushed or polished chrome. Some racks are mounted on the wall while others set on the floor. 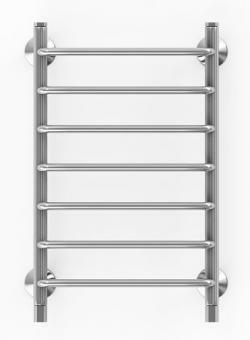 Hudson Reed offers one of the largest selections of towel warmers in a wide choice of styles. Prices range from $249.95 to $949.95. You may find the European design style more in keeping with your bathroom design. Amba Products features stainless steel designs that add a flair of Old World and contemporary. Find one for $704 to $1,520. Marble tile is considered one of the most luxurious surface choices for a luxury bathroom. There are many choices when it comes to which marble to use in your bathroom. Will you use marble on the floors only or will you go with tiled wall? Tiled walls can be floor to ceiling or halfway as a wainscoting. A custom-built shower is also a great place to highlight the use of marble tile. One of the most popular and opulent marble tile is Italian White Carrara. Carrara Tiles features various tile designs, such as basket weave, subway tile, mosaic, tumbled, and in sizes 6"x6" or 12" x 12". Pricing is $7.95 to $19.95 per tile, square or linear foot. The water closet is one of the best designs for any bathroom. 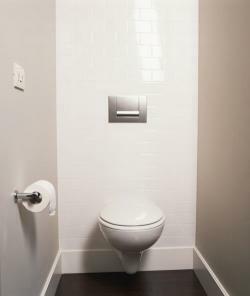 This design places the toilet(s) in a separate space, often the size of a closet or just a bit larger than one. A door seals the room off form the rest of the bathroom. An exhaust fan is an important feature. Luxury toilets are ideal choices for this discreet area of the bathroom. You can shop for a Signature Hardware water closet toilet and bidet. If your style is Victorian, then a white high tank with a pull chain water closet featuring a round Victorian bowl is a perfect match for that claw foot soaker tub. The price starts at $795. A bidet ($210) is a must for this luxury water closet set beside the pull chain toilet or a Dawid Siphonic one-piece elongated toilet, which runs about $460. A luxury bathroom is all about the ambiance for highlighting all the wonderful features in your bathroom design. 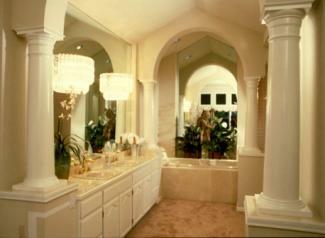 Lighting is needed for the vanity area that includes task lighting as well as lighting above the mirrors. An amber and bronze scrolling lighting fixture ($199.99) is an excellent choice for an elegant design. A pair Schonbek Sonatina silver crystal 17" H wall sconce ($394 each) gives the sense of opulence and can be matched with a 10" wide mini- crystal pendant ($988). The Schonbek 30" Hamilton Rock Crystal Chandelier ($13,343) hung over a drop-in tub, water closet, massage table or tub room makes a bold statement. If modern is your style, then go with this Quantum LED Bath Bar ($599-$999) featuring exquisite optic hand cut crystals. An artistic design scheme benefits from these stunning light fixture designs by Corbett Lighting ($1,444- $7,000+). Recessed lighting is a must as is placing all of your lighting fixtures on a dimmer switch to set the mood. These are a few of the most popular features in luxury bathrooms. To ensure you receive a competitive price, shop around and find luxury items on sale or in the discontinued sector. For a successful design, be sure you absolutely love each item you add to your bathroom so you will enjoy all of them for years to come.